This is a really great and tasty midweek meal which can be prepared with little or no fuss. The beauty of the dish is to cook two and then freeze one for a later date. Heat a large frying pan with the oil and add the red pepper, onion, courgette and garlic and sweat gently over a medium heat until they are softened. After the vegetables have softened (approximately 3-4 minutes) add the minced beef and allow this to brown a little on the pan. Then add in the tinned tomatoes and the beef stock along with the Worcestershire sauce (if using). Allow this to come to the boil, then simmer for 6-7 minutes. Divide the mixture evenly between 2 bowls (or 4 if you prefer individual dishes) and then top with the topping. Mix together the grated cheese, breadcrumbs, thyme leaves and melted butter and sprinkle on top of the bowls. Wrap one of the gratins up in cling film, label and date and pop it in the freezer. Allow to thoroughly defrost before cooking at a later date. To cook the remaining gratin preheat the oven to 190°C/375°F/Gas Mark 5. Place the beef gratin onto a flat baking tray and pop into the oven for 20-25 minutes until it is bubbling hot. 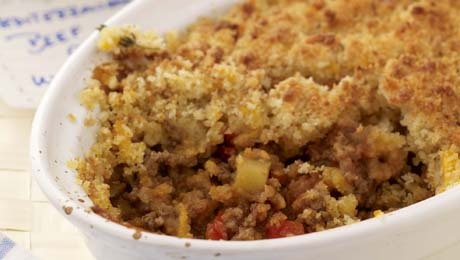 I made this recipe but used turkey mince instead and for the topping I used seeded brown bread... It went down very well and I've made it 3 or 4 times since as my teenagers and four year old love it! Just made Mediterranean beef and it was extremely tasty and easy to make. I left out thyme leaves and courgettes only because I didn't have any. I followed the recipe for 2 people and it would feed at least 4.